Top Notch Material: Primal Pit Paste: No Chemicals, No Toxins, No smell! Primal Pit Paste: No Chemicals, No Toxins, No smell! As I've been looking more into living as clean and healthy as possible, I've also been looking for healthy, natural, organic and beauty and health ingredients. My sister keeps trying to get my to make my own deodorant, but in full disclosure, that just doesn't work for me. I'm a bit lazy when it comes to many things, and the thought of spreading and rubbing deodorant into my pits kind of eeks me out. 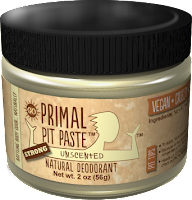 However, during my search, I came across this company called Primal Pit Paste. I emailed them to see if they'd be interested in letting me review their product, and they were all for it! Amy, the founder of Primal Pit Paste, is a certified CrossFit trainer and during large races she noticed that companies were giving out samples of deodorant that contained toxic chemicals. Her concern turned to a primal energy to protect her daughter and provide the world with a safe alternative to harmful products. She turned that energy into research, and that research into Primal Pit Paste. She believes that through Primal Pit Paste, she has succeeded in making a healthy, organic deodorant that actually works for all types of moms, dads, kids and athletes alike. Do you know what is in your deodorant, or even do you care what is in your deodorant? Well, I know I do, especially after all the research I've been doing lately. I was stoked to hear about Primal Pit Paste. There are NO Parabens, NO Aluminum, NO Artificial Fragrances in Primal Pit Paste! Did you know that parabens are thought to produce cancer-causing estrogens, aluminum is thought to be a hormonal disruptor and neurotoxin, which are linked to Alzheimer’s and breast cancer, and that fragrances are lab-created chemicals that are known to have negative health effects, which can trigger Asthma and allergies? Well, memory issues are common in my family, and my daughter is fighting reactive airway disease (they cannot TRULY diagnose Asthma until three years of age). Some deodorants, even natural and organic ones like crystals and salt sprays, state that they have no aluminum chloride; but if you read the fine print they do have potassium alum. The full chemical name of potassium alum is potassium aluminum sulfate, which is still aluminum. All ingredients are disclosed on PPP and they are exactly what they say! Their scented products are made with organic essential oils and smell quite fantastic. Also, Primal Pit Paste is designed to let you sweat, which helps to release toxins in your body and allows you to control your body temperature, which helps you to cool your body. In addition, PPP is designed to allow your body to absorb the ingredients, which helps you detoxify your system. Your skin actually absorbs the good and healthy ingredients in PPP! Another cool thing about PPP is that some people say it lasts up to 2 days, keeping you from having that typical body odor due to the amount of chemicals we tend to take in through food, drinks, and other toxic chemicals in our health/beauty products. More and more people say that most conventional and natural deodorants stop working and don’t last. According to their website, PPP works for extreme athletes in extreme heat (hello Arizona) PPP withstands all sports, endurance races, mud events, CrossFit competition, any WOD (CrossFit insider word for “work out of the day"). Probably my favorite part about Primal Pit Paste is that it doesn't stain or clump. Everyone knows about the deodorant marks when you put on your dark colored shirt or dress and the freak out following when trying to get it off (most of the time impossible). Even some leave disgusting clumps of who knows what on your pit and don't even wash off in the shower. Did you know that the aluminum is what causes the yellow staining on shirts (ah-ha!!! THIS is why ALL my white t-shirts are ruined!). It's designed to rub into your skin, so you're not coating your armpits with funk that ruins your clothing and makes you have to change your outfits three times. I definitely agree with the statement that regular deodorants and antipersperants do not work for the whole day- even the "clinical strength" ones. There are always the mid-afternoon reapplication of "regular" deodorant/antiperspirant. I've had quite a few months to try it out, and PPP definitely works throughout my entire day in mid-summer Arizona heat. I'm sure you all know and remember, but I am a Pediatric Occupational Therapist that focuses on sensory based therapy, which in short terms, is extremely physical, very movement based, and involves LOTS of lifting, pulling, catching and holding. I have a friend who uses this and loves it. I need to try it! Great review!